Being told your child has a neuromuscular disorder is only the beginning of the journey. Whether you have a diagnosis or are still searching, neuromuscular disorders are diverse, often at the forefront of ongoing medical research, and sometimes so rare that patients and caregivers have to become medical detectives of their own. Over the last decade there has been a significant expansion of resources available to patients and caregivers to help identify, manage, and understand neuromuscular disorders. Neuromuscular disorder is a blanket term that covers a wide range of disorders affecting nerves and muscles than can present from infancy to adulthood. They include: muscular dystrophies, spinal muscular atrophies, hereditary neuropathies, congenital myopathies, myasthenias, myotonic syndromes, metabolic myopathies, and inflammatory myopathies. Symptoms and outcomes vary widely depending upon the disease and include weakness, muscle loss, pain, and numbness. In addition to skeletal muscle problems, many people with neuromuscular disorders suffer from respiratory, digestive, or swallowing problems. Importantly, certain genetic causes of neuromuscular disorders (e.g., the Titin gene or TTN) can cause heart problems. While a sizable number of patients are able to pinpoint a diagnosis, too many are left with neuromuscular disorders of unknown etiology. These are often rare disorders or orphan diseases that are the focus of foundations that connect families and promote research. Clinicians struggle with diagnosing neuromuscular disorders because of a lack of understanding of what neuromusuclar disorders look like (especially in younger children), and vague symptoms such as weakness and fatigue in older patients. Historically, testing for these diseases was expensive and sometimes invasive, including MRIs, electromyograph and nerve conduction studies, muscle biopsies, pulmonary function testing, echocardiograms, and genetic testing. Significant delays between symptom onset and diagnosis can result in poorer outcomes for patients, higher medical costs as patients and their caregivers pursue a diagnosis, and delays in identifying potentially life-saving treatment. At times, it seems like there are almost too many resources out there for families working with a neuromuscular disorder. Some, like the Muscular Dystrophy Association (MDA), may be familiar. The MDA is an excellent resource, as it provides detailed overviews of most disorders, as well as diverse community-based links to clinics, patient and caregiver communities, summer camp, and ongoing research. But what do you do when you lack a clear diagnosis? Then things get trickier, to say the least. Navigating the challenges of a child with a neuromuscular disorder of unknown origin, I’ve faced certain distinct problems and I’ve found excellent resources to help me resolve them. Caregivers will find videos and other supporting information to help distinguish between normal development and some of the characteristics of various neuromuscular disorders by age. Importantly, there are materials that are designed to be shared with clinicians to begin a conversation about the possibility of a neuromuscular disorder and how to proceed with referrals. I wish this resource had been available when my daughter was an infant. My life would have been so much easier! I would have marched into several different doctors’ offices, turned on these videos, and used them as a conversation starter. While my child is now older, I still use this resource because it allows me to do a reality-check of what is “normal” or not, and it allows me to communicate with new specialists to indicate what my daughter did (or did not do) years ago. Cure CMD and its Facebook page. 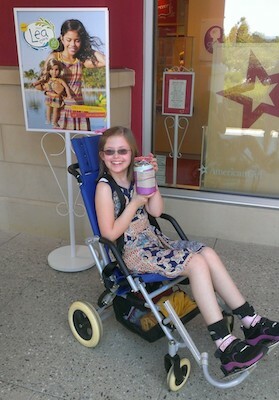 According to its Director of Operations, Rachel Alvarez, the focus of Cure CMD is to, “Keep people alive and thriving.” Families facing neuromuscular disorders confront numerous challenges. Cure CMD and its Facebook page link patients and their families to information and support groups. Families are able to share the ins and outs of living with neuromuscular disorders regardless of where they live or how rare their disorder. Not only can parents find support, but as your child ages there are teen connections and support networks for eventual adulthood and independence. In short, Cure CMD is a resource for caregivers and patients, and it has the breadth to support your growing child. Parent and patient communities have been some of the most important sources of information for my family as we’ve navigated various health issues. Families know what it is like to live with a disorder, what works for them, and what resources are out there. Working with families who have been there and done that is invaluable, especially if your family is facing a rare disorder. It’s possible to forge lasting and valuable friendships through these communities and isn’t that what life is all about? Formed to assist patients with genetic muscle disorders, the CMDIR offers patients a private, HIPAA-compliant, secure venue to house their medical records. This allows patients and caregivers to do several things. First, patient records are accessible (and shareable) from anywhere there is computer access. Since patients fill out annual health surveys, these provide a valuable record for themselves, their clinicians, and researchers regarding disease progression. Finally, CMDIR promotes connections between researchers (academic, pharmaceutical) that is particularly important for those facing rare or unknown disorders. All patient information is de-identified unless explicit permission is given by the patient to share personal details. Working in partnership with CMDIR are the Congenital Muscle Disease Tissue Repository (CMD-TR), where tissue samples are centralized for sharing with research teams, and the CMD Biobank at Corriell, where blood and/or skin samples are sent for cell line generation. These are additional ways patients can contribute to ongoing research regarding their disorders. Having medical records available in a secure format is valuable, especially if you move or visit specialists in other cities. It’s also reassuring to know that medical records are safe in case of a catastrophe like a fire or flood. Importantly, CMDIR includes records that go beyond the traditional focus of skeletal muscle disorders (orthopedic, mobility, neurological); systems that are often affected by neuromuscular disorders and directly affect quality of life such as cardiac, digestive/swallowing, and respiratory health are also included. For our family, like many living with rare disorders, the CMDIR is essential in linking us to researchers doing cutting edge work on the genes that might be responsible for our disorder. It is even possible that, over time, if larger numbers of patients are assembled, pharmaceutical companies could be enticed to begin exploring treatments. Various foundations devoted to researching specific disorders including Cure CMD noted above. While these are too numerous to list here, two excellent examples are the Joshua Frase Foundation and the Jain Foundation. The Joshua Frase Foundation is a leader in finding a cure or treatment for centronuclear and myotubular myopathies, whereas the Jain Foundation focuses on muscular dystrophies causes by dysferlin protein deficiencies. Both offer patient registries, connect families on Facebook, and drive research. For example, the Joshua Frase Foundation recently supported a patient advocate’s attendance at an international conference exploring Titin mutations. Alternatively, the Jain Foundation currently offers free genetic testing for those who suspect a limb-girdle muscular dystrophy or distal myopathy. Patients, caregivers, or physicians can complete an online questionnaire to see if they qualify. If they do, a saliva sample kit will be mailed and results are typically returned in several months. Foundations are important resources in so many ways. Not only do they connect families to each other and the research community, they also support other endeavors. In short, they are force maximizers when it comes to neuromuscular disorders, and they bring expertise, passion, and resources to families facing these disorders. The Jain Foundation’s free testing is an example of the kind of additional support families can find that may not be otherwise available through their clinicians or as a result of limited health care coverage. Over the past dozen years that my family has been struggling with a neuromuscular disorder we have witnessed amazing changes in the types of resources available to patients, caregivers, and clinicians. Like many families, we’ve faced the frustration of both out-to-lunch and well-meaning clinicians who want to help (or don’t), health insurance struggles, and the loneliness of having a disorder that no one understands (including one’s doctors). Each of the resources I described above has been essential in different ways to improving our quality of life, whether as a patient or caregiver. I’m confident that in another dozen years the connections, particularly with other families but also with researchers, made possible through these resources will have gotten us closer to a better understanding of what we’re up against and how to manage it. Each resource enables and enriches in its own way and I’m looking forward to discovering even more. Karla J. Cunningham is a mom and writer living in the Bay Area, California.